Housed in a listed building, the John Gray Centre contains a new Library, Archives and Museum for East Lothian. We were responsible for the design and fitout of the museum, the presentation of the archive material, branding for the whole project, street furniture and signage throughout the building. This was an HLF-funded project and included a strong community emphasis. 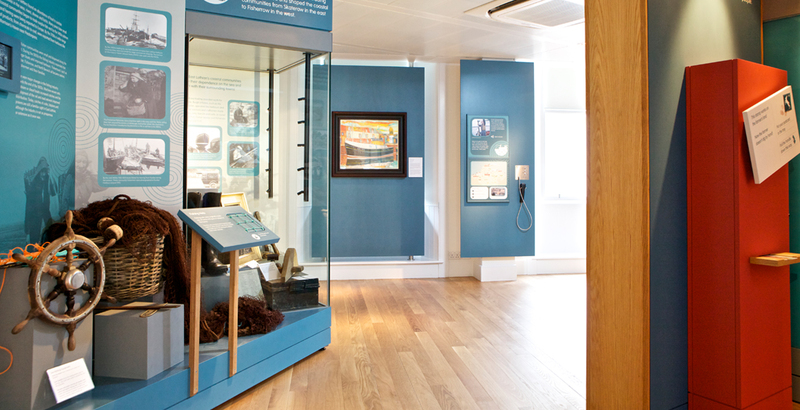 The Museum incorporates updateable displays and cases which are curated by the local community. Audio reminiscences can be easily updated and link in to updateable interpretive and orientation panels. The layout and content of the exhibitions are excellent, with plenty to interest and engage both adults and children, and the staff are very friendly. 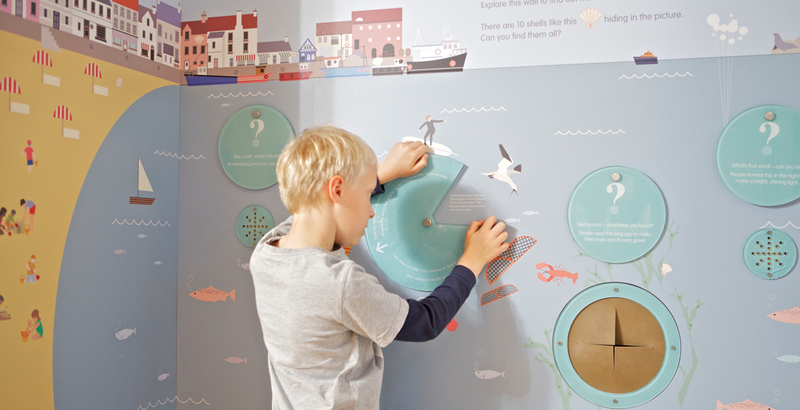 Interactive illustrated wall with touch and smell interactives and a quiz element. 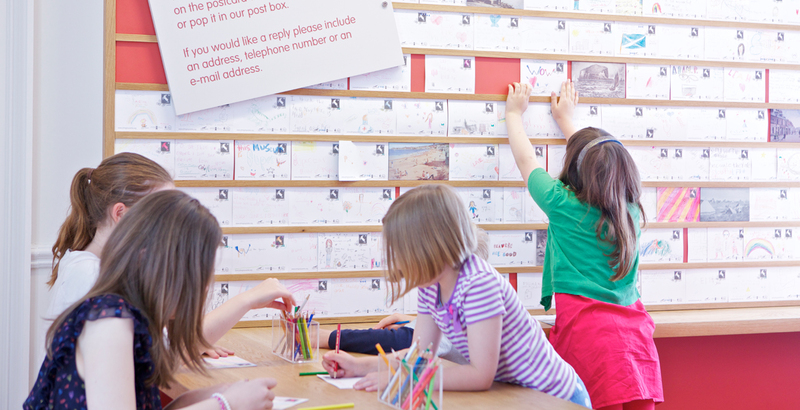 We used commissioned illustration for some of the children’s interactive elements, including this postcard which children use to collected printed stamps as they progress through the museum. A thematic timeline with a children’s timeline below. The open shelves contain children’s toys through the ages which children can take out and play with. Four display cases which are easily updateable can be curated by members of the local community. They include audio and handling areas. Completed projects can be photographed and archived on the website. 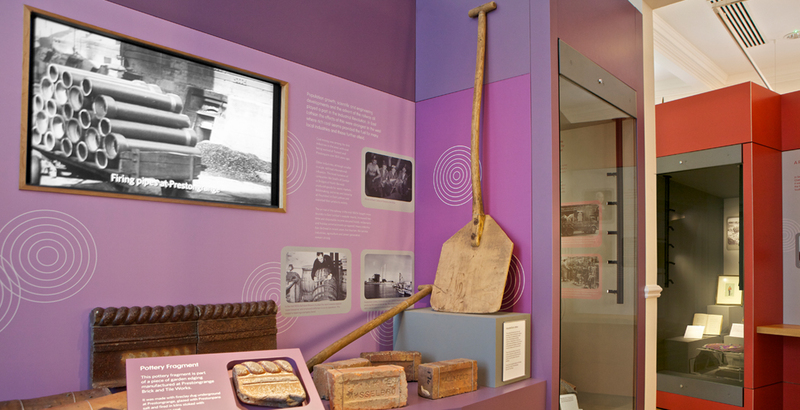 The museum has a strong emphasis on community involvement and the displays have been designed to respond the needs of varied visitor groups. The branding was carried through to the bespoke-designed polished concrete benches internally and in the streetscape outside.